The main concept I have learned with this course is the importance of writing in an active voice and using simple language. Working for a government agency for over 10 years my habit has been to write very bureaucratically. In client satisfaction our formal written responses are general replies, using template that are impersonal. As the importance of engaging in social media with the public has taken hold on government department, our communication methods and styles have adapted. There is no room, on Facebook and Twitter to spin things in a lengthy explanation about how a process or regulations applies to one’s experience. This simple style of writing should also be adopted on our website. This would simplify a users search for information and avoid calls and emails requesting information that is available on the website. In addition, using plain language in our communication captures the audience and most importantly, the writer comes across as honest and informative. The biggest challenge my team has diffusing irate clients are the allegations that we are not concerned over an unpleasant experience as simply prote4cting our staff at the screening checkpoints. What I have noticed through our adapted communication style on Facebook and Twitter is that diffusing upset clients has become easier due to the plain and honest language we are using. In the coming months I am hoping to adapt this style of writing through our formal response as well. COM 0014 Blog post 6 – What is the greatest challenge your business must overcome? The Canadian Air Transport Security Authority (CATSA) is mandated by the Government of Canada and authorized by the Canadian Air Transport Security Authority Act to protect the public by securing critical elements of the air transportation system. Under this mandate, CATSA screening officers are required and authorized by the Aeronautics Act, the Canadian Aviation Security Regulations (CASR), and security measures issued by Transport Canada to inspect passengers and their baggage to ensure that non-permitted items are not carried onto an aircraft. In nutshell, the greatest challenge CATSA’s faces is balancing customer service alongside government regulations. In performing their duties, screening officers are required to adhere to strict procedures that establish the manner in which screening is to be carried out. Much of the travelling public do not inform themselves of regulations new or dated and then question the search of the belongings or person. For example, screening officers have a responsibility to ensure that travellers are aware of the regulations governing the transportation of liquids, gels and aerosols and ensure that they comply with these requirements. To achieve this objective, screening officers assist passengers through the screening process by drawing their attention to properly storing liquids, gels and aerosols. Our challenge is how to turn this objective and market it as a customer service standard rather than unconstructive conduct. Humanizing the unpleasant requirement of aviation security, without the fear factor of why we do what we do, will continue to be a challenge I look forward to working on. COM0014 – Blog 5 – Personal Brand – For the people and for government. As the supervisor of Client Satisfaction at the Canadian Air Transport Security Authority (CATSA), I have realized that Social media’s influence is making its mark on the way we communicate our mandate and handle concerns and enquiries from the travelling public. In the past my team was managing clients concerns by telephone and email. In the last year there has been a significant shift in how we communicate with our clients. I have an understanding of what people want and what they expect by using social media. Developing a strategy on how to acknowledge and respond to social media complaints has become my new skill. Working with and building relationships with the communication team, legal team and regulatory team I have become the go-to liaison between groups that usually do not communicate properly in the common goal to avoid reputational damage as well as have a satisfied customer as an end result. My main goal is to restructure the internal network at CATSA. Currently, CATSA’s objective in being active on social media is to build relationships with our stakeholders, educate the travelling public. I provide insight on how social media can be used not just with the travelling public in mind but how to corroborate with stakeholders to provide a better understanding of who is responsible for what and why. To empower the individual who questions the experience they have had using our services. “Our” ultimately defined as stakeholders. The traveller does not usually have a clue s/he has interacted with and at which point of their itinerary, several government bodies and private industry. Was it CATSA? Was it customs? Was it the Transportation Security Administration (TSA)? Was it the airline or the airport authority? Social media provides CATSA the opportunity to engage the travelling public with the intention of redirecting them to the proper authority to voice their concerns to the right authority the first time. In light of my knowledge and experience working in several customer service centres for several government programs, I am an assent to the general public in referring them to the correct authority even when outside the CATSA mandate and giving them a guideline of what to ask, to whom and what they can expect as a follow up. With this comes an improved relationship between client and agency and reputational risks are reduced. Through their engagement on Instagram, Wayfair publishes images of professionally designed rooms one would see in a home interiors magazine. 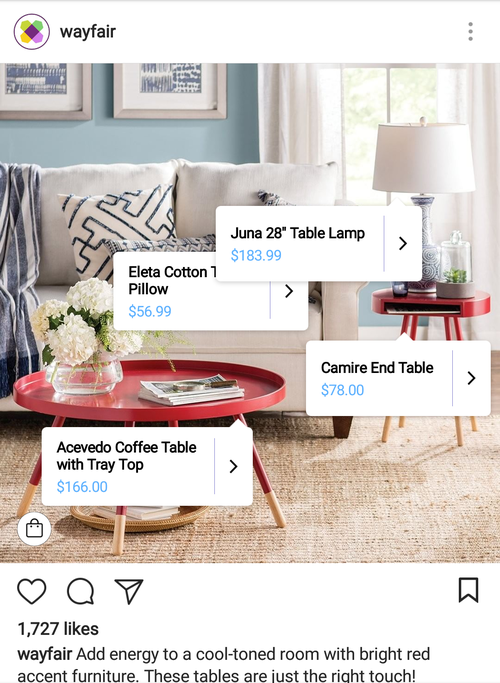 The added feature is that in these images Wayfair flags the products that can be purchased through their website with the price included. These images include a shopping bag icon that with a single click leads the consumer directly to the landing page of the product with information on shipping and availability. The Instagram images also include the ability to like and share an image, which extends the businesses reach. It’s quick, it’s easy, it’s instant gratification. In order to obtain the audiences attention and retain it throughout your engagement, I learned two main things about storytelling thus far. Writing in an active voice engages the reader to a greater degree. The goal of the communication is clearer and to the point. As an employee of a communication branch for a government department, using plain language is difficult to get through the approval process. Fortunately, due to an increase in social media engagement the branch has been pushed to use this method of written communication more often. In most cases we take the time to reflect and prepare the content of the story we want to tell. How to introduce it, what are the main points and what do you want the readers to gain from it? What I have learned is that reflecting on tone your communication will take is equally significant. Is the purpose of your tone to be witty, humorous on a lighter tone? Is the aim to be neutral about a given story, serious in presenting facts? Are you attempting to gather support and empathy is the route you need to take? Or is a voice of protest and disapproval better suited for your engagement? The Canadian Air transport Security Authority (CATSA) social media presence is growing in followers and engagement. The organization’s target audience can be reached mainly through Facebook and Twitter platforms. The amount of post per week are consistent but the organization should place more emphasis on video and live streaming where feasible. There is an increase in live streaming in social media. CATSA would benefit from this type of video and obtain more shares and an increased amplification throughout the target audience and successful engagement with their stakeholders. One of the key points I have noticed is the conversations on the platform are not automated. Every conversation free text and based on a one on one engagement with a specific follower. CATSA would benefit in incorporating auto replies as data shows the top 3 to 5 enquiries tend to be based on the same topic. During the period I monitored the organization, the common topics are questions about travelling with liquids, aerosols and gels, travelling with medications and questions about intercepted items from checked baggage amongst the top three. As in Facebook, the organization Tweets can also be periodic real-time posts. In this platform, the audience is especially interested in what is happening now. The organization can monitor what is happening in airports feeds and use pertinent events or issues to engage with the travelling public as the issue is occurring. For example, a storm has caused several delays, this is an opportunity CATSA can extend their reach through the airports platform advising the public that there are increased wait times at our security checkpoints and to arrive well in advance. In addition, CATSA can reach out through the Weather Network and obtain an increase in followers once we link in to this new audience. The question of reach and amplification is an area where CATSA needs to improve on particularly on Twitter. There is data showing followers are steady but show no significant increase. There is a steady activity in retweets. The area of success on this platform is how well the organization refers their audience to the website for more detailed information and especially to manage reputational risks in the complaints that are made through this platform. This past summer I went to Florida with my husband and two kids. We experienced the magic of Disney. That said, my disclaimer, this is not a feel good, top tips of getting the most of your Disney trip. On the contrary, my purpose is quite the opposite, I am telling my story as a warning to those considering Disney as a future trip, don’t do it! My family and I went to Magic Kingdom and Animal Kingdom and our accommodations were off site ten minute drive from the parks. The mobile application https://disneyworld.disney.go.com/en_CA/plan/my-disney-experience/mobile-apps/ provides a map of the parks that includes a GPS to guide you to where you want to go, details where the characters are and the wait times. It includes events planned for the day as well. Great concept, if the application wasn‘t constantly refreshing and sending you back to the main menu. The app. doesn’t specify that Snow White won’t come out in the rain, even if just misty type rainfall. My daughter and I ran across the park to make sure we make it for the meet and greet to find out, princesses are high maintenance. We waited 90 minutes to meet Ariel in her underwater cave. To find her sitting on a rock structured bench where my daughter quickly sat beside for the snap shot and rushed along her way for the next child in line. I never had the chance to get Ariel’s signature because my pen sank to the bottom and we were whisked away by cheery Disney helpers. That’s right. The helpers don’t have pens on them solve this circumstance that must occur to more than one parent. When asked if they have a pen I could borrow, the oh so very chipper helper referred me to the market area where I could purchase one. The same $12 USD one lost at the bottom of my backpack. In addition, the kids kept arguing about what characters to meet and what rides to go one. My husband and I had to split up for most of the day to get the kids each what they wanted to experience. There are not enough rides at this park. I don’t consider the safari jeep tour a ride. My 8 year old was jonzing for a roller coaster, bumper cars, something that turns, swivels or goes upside down. The safari tour we waited over 90 minutes for – with a fast past by the way – let us experience how animals find refuge in the shade in Florida’s hot weather. My son did get enjoy the bumps and turns of the jeep making it way along the terrain. Go to the Toronto Zoo instead. ensuring the kids are hydrated, meeting the demands of excited children who do not have the patience to deal with long wait times and heat, dealing with the CROWDS – that by the way are not so cheery – was not worth the toll it took on my budget, my marriage, or my mental well being. Following our days at Disney we had the good sense of booking five days away at the beach before heading back home. Beautiful weather, gorgeous beaches, frolicking dolphins and diving pelicans in the ocean, sand castles and strawberry ice cups. Time was no longer looked at. The whole family had fun and my kids tell more stories about their time at the beach because they probably forgot about meeting Mickey for 60 seconds. It’s a good thing I have the picture to prove it. Social media’s influence is making its mark on the way government organizations communicate their mandate and handle concerns and enquiries from the public. The question lies in how many sites should a government body engage in and what voice is best to represent it’s mandate. As all organizations, in order to engage in social media, a plan, a strategy on what and how to use social media for the benefit of the organization is required as well as how to manage the risks involved. I don’t believe an organization, especially government entities; have to engage in every method of generating social meeting interest. This may be good practise for the individual looking to market him or herself, but for government two or three sites or strategies that fit with the organization should be sufficient to focus on. This reduces the potential reputational risks in having too many active roles in social media sites and not keeping up with a consistent message. That said, the voice or tone that used on platforms chosen, be it Twitter, Facebook, YouTube and the like, will determine the type and number of followers that engage with the department’s platform. We already have a predetermined opinion of the government’s “voice”. It’s bureaucratic, monotonous, and less than transparent. How does a government agency turn that public opinion around. Using the right voice and communicating effectively through social media can do just that. Social media can break the barriers of red tape to inform the public in a two way conversation that is engaging and listens to the audience. The conversation can be more friendly, comic even, leaving the audience with a new customer experience when dealing with the government. Rather than spending countless minutes on the telephone waiting for the next available agent to help you find the online form to complete your income taxes, a simple witty tweet informing you of where to find the information will leave the audience with the answer to their inquiry, a smile on their face and hopefully a share of feed to assist anyone else that may be looking for the same thing. Kill two, maybe three birds with one Tweet. The internet – Essential service or equal right? Lower income individuals may not have internet access at home and therefore rely on the ability to access it at a nearby library or other public venue. When we question the access of the internet in remote areas, which we have a lot of in Canada, is it fair to hike the cost of broadband access due to the area you live in? Also, in light of growing reliance on the internet and social media outlets by organizations, private and public, to broadcast new information, new product and services and as a way of hiring staff, accessibility becomes an important question. Should equal rights to the internet be administered into law as equal rights to education, to accessibility due to one’s disability or to gender equality? I don’t agree with the idea that broad band should be considered an essential service. When I think of essential services I think of “do or die” type of services. I would hate to think that we are comparing the internet and information and or opportunities it brings to an individual, to the paramedic we call upon to save a life, or a police officer that intervene in a dispute, or the vast number of medical services used on a daily basis to save lives. The internet, not quite that essential. That said, access to the internet should be more readily available and affordable. I think we should review the question of equal rights to the service and opportunities internet access provides as a way of improving the economy and supporting communities that may otherwise be very separated from businesses and organization that support the community and the families in that community’s needs. In my own pursuit of happiness I have decided to act against my anxiety and society’s expectations of what it is to be successful, and sell my 1 acre property with a newly renovated house that includes the custom made dream kitchen I thought I always wanted. I had doubts; many, many, many doubts. My husband kept questioning my reasoning and asking “Are you sure you want to move”? I questioned myself, changed my mind and began to work on the idea of building an addition to the existing house I owned! Then took a few steps back and evaluated myself, who am I now? Rather than make a list of what makes me happy, I made a list of what makes me unhappy, what annoys me, what are the social situations that anger or frustrate me. Now I know, no doubts, I not only want to minimize and not buy into this world that pushes the need to have more, I need to do this if my goal is to be happier.